Specially formulated to thoroughly clean all models of the Airwasher, Venta Cleaner is a solution that should be used biannually. Simply pour an entire bottle of Venta Cleaner into your unit once every six months and run the Airwasher as you normally would. This process will loosen deposits and mineral build-up in your unit, ensuring the highest performance from your Airwasher. Cool, damp air can often trigger allergies and mold growth, but these concerns can easily be battled with this portable and ENERGY STAR rated 45-pint (21.3 litre) dehumidifier from Danby. Able to remove excess air moisture from areas of up to approximately 2,500 square feet, this unit is the perfect addition to your basement to keep dampness at bay. With a fresh white finish, user-friendly electronic control panel, automatic defrosting system (to keep the coils ice-free) and adjustable humidity settings, this unit has everything you need. Ecohouzng ECH1030 Dehumidifier is a new line of Energy Star rated portable dehumidifier. Light weight and heavy duty casters allow their ultra portable dehumidifier to be moved and placed almost anywhere. Keeping with their tradition of making energy efficient product. In addition to portablility and energy efficiency they've added the low temperature operation to their feature packed dehumidifier line. Venta Cleaner Specially formulated to thoroughly clean all models of the Airwasher, Venta Cleaner is a solution that should be used biannually. Simply pour an entire bottle of Venta Cleaner into your unit once every six months and run the Airwasher as you normally would. This process will loosen deposits and mineral build-up in your unit, ensuring the highest performance from your Airwasher. Venta Cleaner is rated 4.9 out of 5 by 9. Rated 5 out of 5 by Jmg19 from Very quiet. It sits close to my bed and I... Very quiet. It sits close to my bed and I can now sleep better. The air in my room is cleaner with more moisture. No more dry air. Rated 5 out of 5 by LW from I used this product once before to clean my Venta humidifer. It worked pretty good. I used it 3 m... I used this product once before to clean my Venta humidifer. It worked pretty good. I used it 3 months after I started using the humidifier. I use the Venta "water treatment" solution about every 10-14 days as instructed in the manual. Rated 4 out of 5 by DBRB from Seemed to clean well and it needed a good cleaning... Seemed to clean well and it needed a good cleaning after only 2 months. Rated 5 out of 5 by RWH from Love our Venta. Use it in the main bedroom. 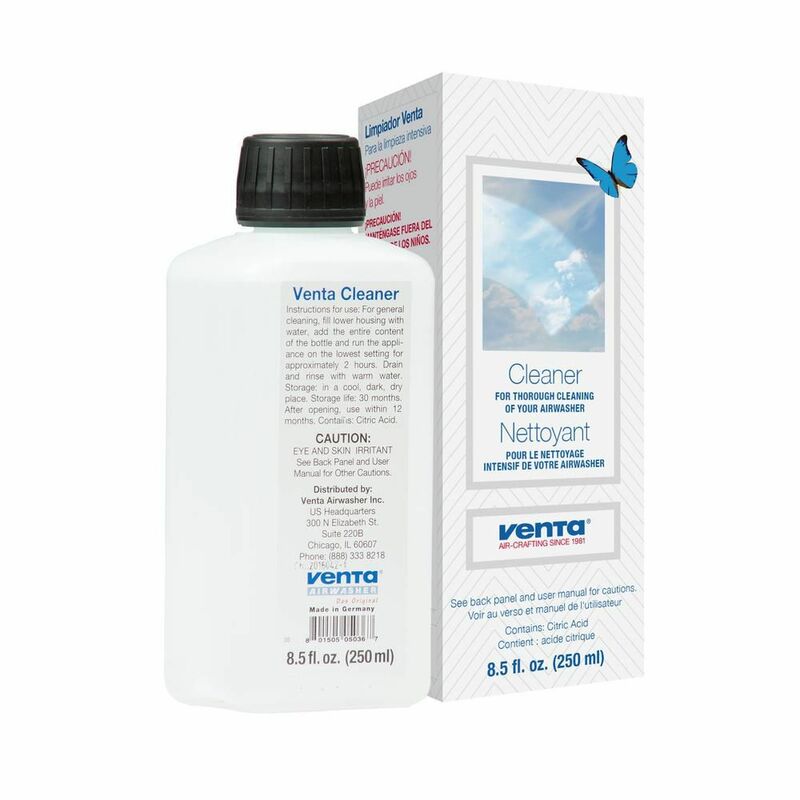 Use the cleaner to maintain/improve performance (like... Love our Venta. Use it in the main bedroom. Use the cleaner to maintain/improve performance (like maintenance on your car or any other important machine in your life). The Venta takes care of us, so we want to return the favor. Rated 5 out of 5 by gardenguy7 from We purchased two Venta Air Washers in the past couple of years, and the Air Washer Cleaners and A... We purchased two Venta Air Washers in the past couple of years, and the Air Washer Cleaners and Additives keep them running in tip-top condition! Both have just been cleaned and will run reliably for another 5-6 months. We find the ease of cleaning and general use to be incomparable with other types of products for adding moisture to dry, inside rooms in winter. No filters to replace is another great feature of the product!